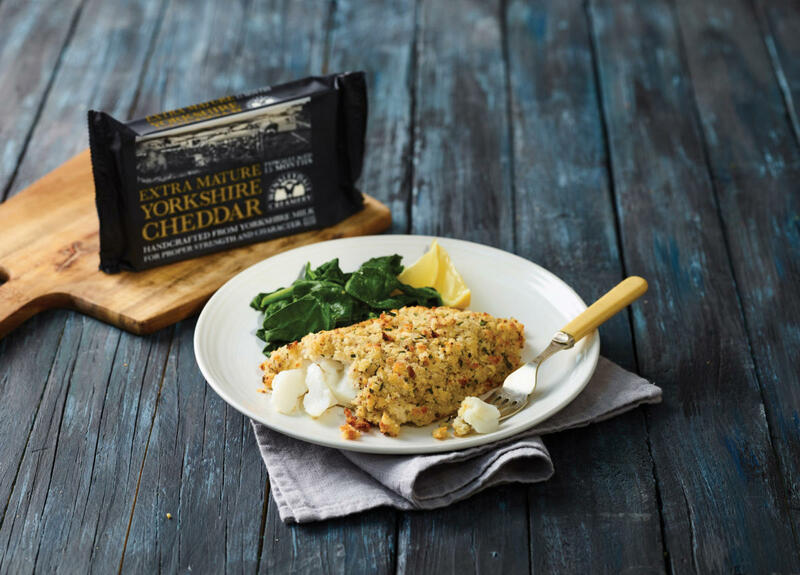 New Yorkshire Cheddar baked Cod – our extra-mature cheese is a perfect match with fish! Step 2: Blend the white bread to create breadcrumbs and mix with the wholegrain mustard, freshly chopped chives and grated Yorkshire Cheddar. Step 3: Melt the Yorkshire Butter in a pan. Using a pastry brush, coat the fresh cod. Step 4: Tip the contents of the blended crumb mixture into a bowl and place the upturned cod into the mixture. Make sure there is an ample coating of the crumb mixture on each piece of cod. Step 5: Place the cod pieces on a tray, lined with greaseproof paper or rubber mat, so that the cod comes off easily once cooked. Step 6: Place in the oven for 8-10 minutes (depending on the thickness of the cod), until the crust looks golden. Chef's Tip: Serve with some freshly wilted spinach & lemon and enjoy!